JERUSALEM (Reuters) - An election campaign video starring Israel's far-right justice minister spoofs perfume ads to sell her political priorities, but has a strong whiff of muddled message given the fragrance is labeled "Fascism." The intended meaning of the ad - three weeks before Israel's election - is largely lost on people who just see the word fascism in English but who do not speak Hebrew and so cannot understand the voice-over. In the spot, Ayelet Shaked walks slowly down a staircase, her hair gently tossed by a breeze, as a female narrator whispers seductively in Hebrew: "Separation of powers", "Restraining the Supreme Court". Shaked is frequently critical of Israel's top court as being too liberal and interventionist, but these and other views of her New Right party have been roundly criticized by leftists. Some, the commercial implies, may see her views as fiercely nationalistic: former Israeli Prime Minister Ehud Barak once called some of her comments about reforming the Supreme Court "proto-fascist". But, Shaked says, holding the perfume bottle with its label: "To me, it smells like democracy". Reaction on social media to the ad, sponsored by the New Right, ranged from "great" to "strange". "This is one of the most bizarre election ads you have ever seen ... Viktor Orban on steroids," Barak Ravid, the diplomatic correspondent for Israel's Channel 13 TV, tweeted, in a reference to Hungary's far-right prime minister. 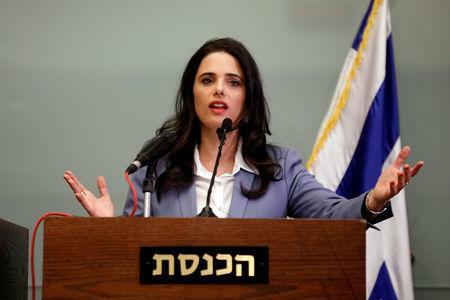 Shaked's New Right party, which she leads along with Education Minister Naftali Bennett, is part of Prime Minister Benjamin Netanyahu's right-wing coalition. It has been sliding in opinion polls and is forecast to win about six seats in the 120-member parliament in the April 9 election.